Will you continue to work after you file? Do you have a government pension? How will Teacher Retirement affect your Social Security? Are you eligible for a spousal or ex-spouse’s benefit? How much can you pull from IRAs without making your Social Security taxable? The right strategy can make a significant impact on your finances over your lifetime. I have thoroughly researched the minutia of the Social Security laws and have invested in an excellent software package to help clients make wise decisions regarding their benefits. You paid thousands in, it is worth the time to make sure your withdrawal strategy maximizes what you get back. Bob and Becky were high school sweet hearts and have both earned good money over their careers. They both will turn 61 this year and have enough money to retire, but haven’t decided when to stop working and when to begin withdrawing Social Security. Using my software, I can run almost every scenario to help them evaluate the important choice they have before them. 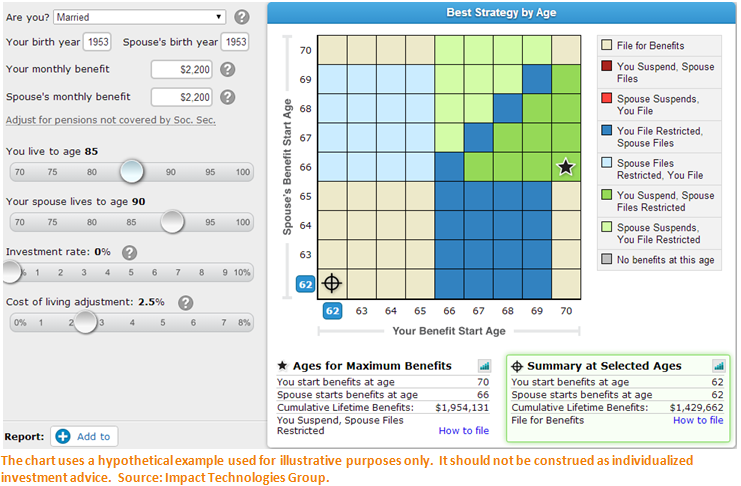 As you can see in the bottom right hand corner where it says “Summary at Selected Ages,” Bob and Becky would receive $1,465,404 if they both took Social Security at 62 with the assumptions below. With my software, I can show them the optimal strategy (where the star is) is to file and suspend. File and Suspend is often the best Social Security Maximization strategy that helps couples pull thousands more from Social Security. Unfortunately, many people, including Social Security Employees, are not familiar with this strategy. In the example above, I show Bob applying for Social Security at his full retirement age (66) and then immediately telling Social Security to suspend his benefit. He has to file so that Becky is able to file for a spousal benefit. At Becky’s full retirement age, she is allowed to collect 1/2 of Bob’s Social Security without hurting how much he can withdraw for himself. In my case study, Becky takes a spousal benefit from age 66 to 70 which allows her to grow her own benefit by 8% per year. Bob is not receiving a benefit from age 66 to 70, but his benefit is also growing by 8% per year. When they both turn 70, Becky and Bob both apply for their own, much larger benefits. By implementing the File and Suspend strategy, Becky and Bob would receive $524,469 more from Social Security than if they both began withdrawing at age 62. As you can see, this type of planning can add serious value to your retirement and it is important to seek expert advice to avoid pitfalls and get as much back from Social Security as you can. If either you or your spouse paid into the Teacher Retirement System (TRS), it becomes even more complicated. If you would like to learn more about Social Security, please click here to read my white paper. If you would like personalized advice on how to maximize your Social Security, please contact me today for a free consultation.